The perfect bag for all your gear! Accommodates the Porter Cable 7424XP and most other polishers. Part tool box, part organizer, all Pinnacle! The Pinnacle Detailer’s Bag is a storage bag and organizer for your detailing supplies, even your polisher! Just like a carpenter’s tool box, the Pinnacle Detailer’s Bag carries your tools of the trade. This well-made, generously sized bag holds bottles, buffing pads, brushes, and everything else you need to tackle any detailing job. This bag reminds me of the old-fashioned doctor’s bag. It’s perfect for a mobile detailer making house calls. With 12 pockets, two large compartments, Velcro™ fasteners, and interior elastic straps for small items, the Pinnacle Detailer’s Bag literally has a place for everything. At 17 inches long, the Pinnacle Detailer’s Bag accommodates the Porter Cable 7424XP and most other polishers. It has a bottom compartment for pads and backing plates. You can fit 10 16 oz. bottles, two 8 oz. bottles in two smaller pockets, multiple detailing brushes and swabs, towels, and there are even Velcro™ fasteners on the top of the bag to secure an extra extension cord. Whew! That’s a lot of detailing supplies but the Pinnacle Detailer’s Bag can handle it. The Pinnacle Detailer's Bag has multiple exterior pockets for products and tools. Load it up! The rugged construction of the Pinnacle Detailer’s Bag means you can fill it full of products without putting any strain on the materials. The stainless steel handle is secured into the hard end panels that give the bag its shape and strength. The entire bag is made of rugged, water resistant, 600 denier nylon canvas. The seams are all reinforced with canvas and metal studs. The bottom of the bag features two non-skid feet. Inside, the bag has room for your Porter Cable 7424XP, buffing pads, detail brushes, a chamois, and more! 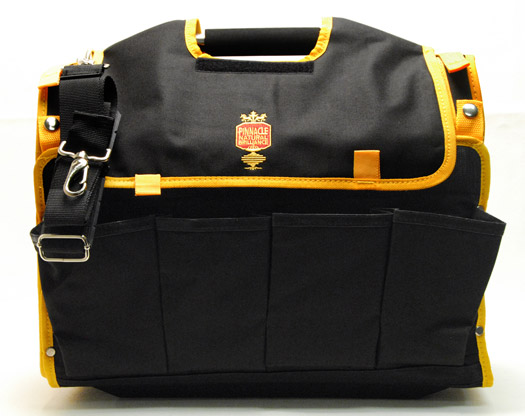 The Pinnacle Detailer’s Bag is a must-have for any detailer or hobbyist. The bag is big, its functional, its organized, and it looks great. The red bag has black trim with the Pinnacle Natural Brilliance logo embroidered on the top flap. Polishes, towels, a buffer, and pads are the tools of your trade and the Pinnacle Detailer’s Bag is your tool box. Use the bottom pocket to hold towels, wash mitts, and microfiber gloves. * Contents of bag sold separately. Very nice bag which can fit all my bottles and towels, especially it's for free over $125.